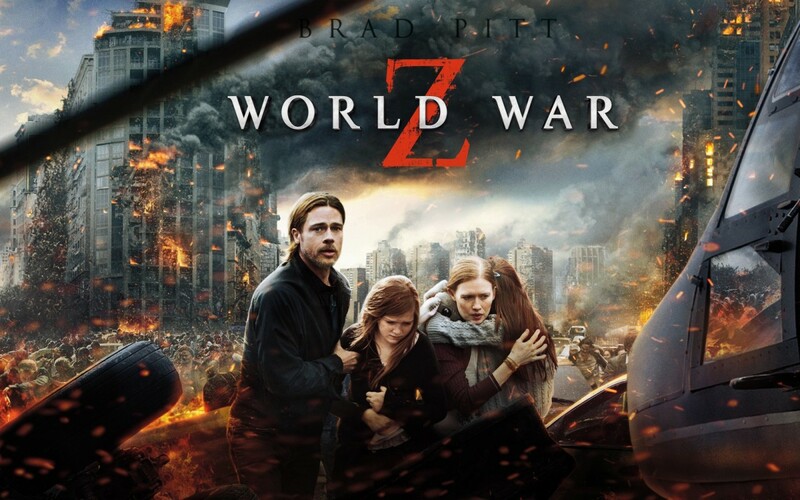 Last Thursday (Halloween 2013) I finally decided to watch World War Z—one of the biggest movie productions of 2013, featuring Brad Pitt in the leading role. It is a zombie movie, so it kind of fits Halloween day, but that was a pure coincidence. I neither care about Halloween nor Zombie movies. When the film was being shown in local cinemas here in Leipzig a couple of months ago, a friend of mine suggested that we go together to see it, but I objected strongly on the grounds that it seemed very silly. This was confirmed later by one of my flatmates who described the movie as a debacle. Later, another flatmate of mine watched it and described it as too bad to the extent it is funny. 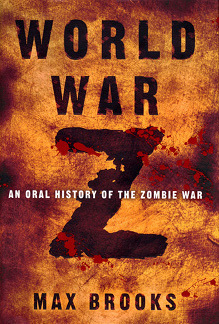 This has aroused my curiosity, but not enough to bother watching it until I watched World War Zimmerman—the third episode of the new season of South Park—in which World War Z is bitterly ridiculed. I thought then that I must watch this film. The day before yesterday, which happened to be Halloween, I stayed in bed all day long because of being sick, so I had enough time to watch two movies—one of them was World War Z. The film turned up to be very bad indeed, but, unfortunately, not to the extent it was funny, as my second flatemate had claimed before. From a cinematic perspective, I have nothing interesting to say about the film. It is simply a bad movie, and I don’t recommend it to anyone. World War Z, however, is not only cinematically bad, but also politically, and this is what I am going to talk about in this article. The film narrates the story of Gerry Lane (played by Brad Pitt)—a former UN investigator, who is called to investigate the reasons behind the outbreak of an epidemic virus that turns people within seconds into Zombies. His journey of investigation takes him to Israel, which has constructed huge walls around Jerusalem to quarantine it from the epidemic. An officer of the Mossad informs him that Israel intercepted a message from India which mentioned that Indians are struggling to contain an epidemic of Zombies. Gerry is skeptical how a sober Mossad officer could recommend the building of such huge walls based on then unbelievable allegations of zombies attacking people. The officer answers him that Jews throughout their modern history have refused to believe that many misfortunes were going to occur to them, yet they did occur (mentioning the Holocaust, the 1972 attack on Israeli athletes in Munich during the Olympic Games, and the 1973 Arab war against Israel). The Mossad officer then takes Gerry to see the walls around Jerusalem. Gerry sees that the Israeli army is allowing both Arabs and Jews to enter the holy city, because, as the officer puts it, “every human being we save, is one less to fight.” One sees Arabs and Jews praying, singing, and dancing together in celebration of peace and security. The serenity of the scene, however, does not last long, as the singing of peace and harmony alerts the Zombies outside the walls who climb over each other in massive numbers until they pour into the city and take it over. My first political objection against World War Z is the seemingly honest subtitle at the beginning of the Jerusalem part of Gerry’s journey. It says simply “Jerusalem, Israel.” This may seem like a statement of a fact that should not offend anyone, just like saying “Washington D.C., USA.” It is true that Jerusalem is currently under Israeli control and that Israel regards Jerusalem as its capital, but in reality not a single country in the world other than Israel officially recognizes such claims (see Wikipedia’s article on the official status of Jerusalem here). Even the United States, Israel’s staunchest ally, does not recognize Jerusalem as such. The American Congress has passed in the past two decades several legislations calling the President to accept Jerusalem as the capital of Israel, but neither President Bill Clinton, nor George W. Bush, nor Barack Obama has implemented them. Indeed federal courts and the Justice Department have considered such legislations to be invalid or unconstitutional. To be clear, we are not talking here about Western Jerusalem, which following the Israeli-Arab war of 1948 came under Israeli control and thus it is generally accepted by countries that recognize the state of Israel as part thereof. We are talking here about East Jerusalem, which is effectively the Old City of Jerusalem with its landmark holy sites, including the golden Dome of the Rock, which is easily visible in the scene above. East Jerusalem is part of the Palestinian territories, which was occupied in the 1967 war waged by Israel against Syria, Egypt, and Jordan (the last was in control of Palestinian territories from 1948 until 1967), and, as previously mentioned, no country or international organization (including the UN) recognizes Israel’s annexation of Jerusalem. This little subtitle is nothing in my opinion but an attempt to sanction a de-facto situation that is morally, politically, and legally objectionable. Am I being too cynical? After all, how many people know the international status of Jerusalem? I myself—who grew up in a country (that is, Syria) where anti-Israeli propaganda is a daily matter, and who is supposedly well-informed about the Arab-Israeli conflict—had not honestly known, before I did research for this article, that there is such a unanimous international consensus on not recognizing Israel’s annexation of Jerusalem. I really thought that few countries must have already recognized Jerusalem as the capital of Israel. So why accusing the filmmakers of moral and political incorrectness just because of this possibly “accidental” mistake? If one may gloss over this “incidental” mistake, I don’t think that one could gloss over the symbolism of the walls erected by Israelis around Jerusalem in the film. It happens, “incidentally,” that Israel has been indeed for more than 10 years constructing a barrier to separate most of the Palestinian population in the West Bank from Israelis. The wall is constructed east of Jerusalem so that it effectively serves to annex the city to Israel and isolate it from Palestinian territories. 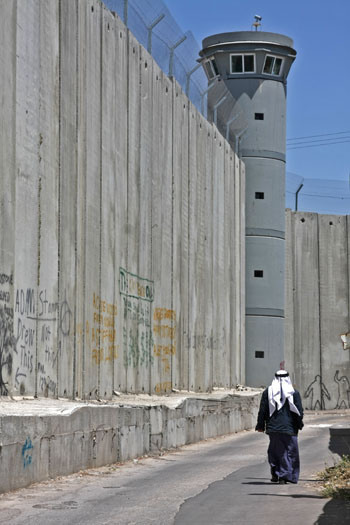 The wall consists in some of its sections, as you can see in the image below, of 8-meter-high concrete slabs, much like the wall depicted in the film to protect Jerusalem from Zombies. The only difference is that the wall in the movie is much higher for greater visual impact. The message, I think, is clear and does not need any deciphering: Israel’s wall in World War Z is simply an allegory of Israel’s separation wall in reality (called the “Apartheid Wall” by Palestinians and many human rights activists), which is supposedly meant only to protect Israel from an “eminent, evil danger”—that is, Palestinian “terrorists”—just like the wall in the movie protects it from blood-thirsty zombies. 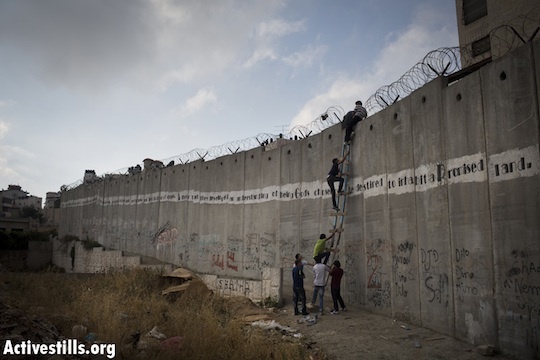 The famous scene of Zombies climbing the wall over each other is reminiscent of attempts made by Palestinians to climb the wall to get to their houses, farms, jobs, or places of worship on the other side, as one can see below. The filmmakers’ choice of Israel as the country that erected walls to protect itself from Zombies cannot be random. 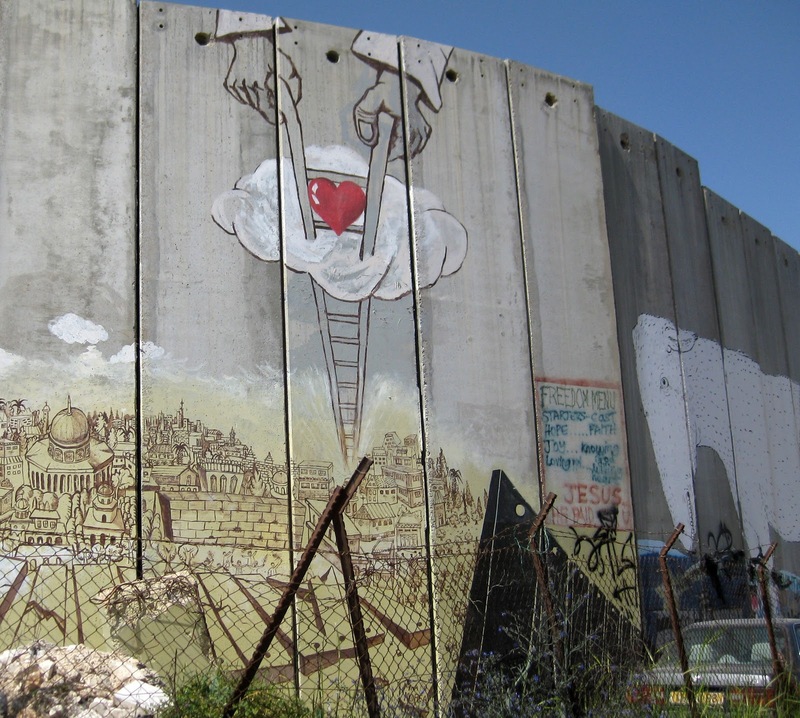 It must have been inspired by the real separation wall in the West Bank. And there is no way that this inspiration can be regarded as innocent or devoid of any political or racist connotations. 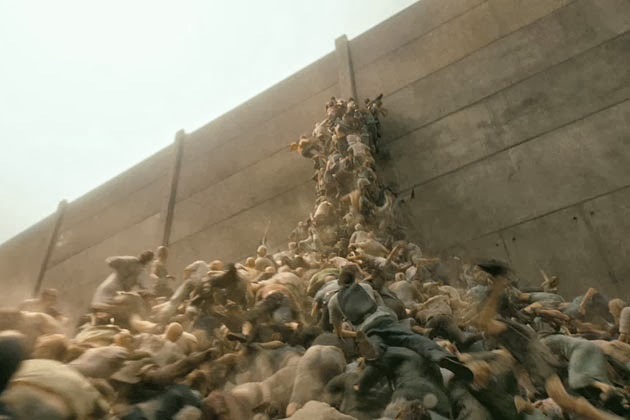 If you watched a movie in which the United States built a huge wall along its Southern borders with Mexico to guard itself against Zombies, could you but interpret Zombies trying to jump over this wall as a reference to illegal Mexican immigrants trying to make it into the USA? Wouldn’t you see such allegory to be racist and politically incorrect? The scene of Israelis and Palestinians singing for peace while entering walled Jerusalem does not lessen the racist connotations of the wall. It is consistent with the Zionist idea that Arabs and Jews can live together in peace and harmony, but only under the supremacy of a Jewish state and the protection of the Israeli army. Israel is willing to accept and tolerate Arabs as subjects and dependents, but not as equal citizens. The concept of a Palestinian state that stands on equal terms with a Jewish state in Palestine or the alternative concept of a unified state for both peoples where the Palestinians might be the majority are both unacceptable to the Zionist ideology that still maintains its hegemony over Israel. I started to wonder whether the walls around Jerusalem was a motif added by the filmmakers or it was already there in the novel, but was dropped out by the writer(s) of Wikipedia’s article. Of course, I neither had the time nor the desire to read a complete zombie novel, so I thought it would be enough to find an online version of the novel and use the magical function of Ctrl+F to search for words such as “wall,” “Israel,” “Jerusalem,” and “Palestine” and see whether the motif of the walls occurs or not. Secondary literature has indeed confirmed my view of the film’s political message and my tentative conclusions about the novel. I have learned from an article published by The Global Jewish News Source that many people have actually panned the film as pro-Israeli. “Or at the very least the most pro-Israel zombie movie ever made” as Jeffrey Goldberg—an American journalist who previously served in the Israeli army—has “admiringly tweeted.” The article also states that what ruins Israel’s plans to keep itself safe from Zombies in the novel is not the harmonious singing of Jews and Arabs together, but the revolt of the ultra-Orthodox Jews, who refuse that Israel withdraws back to the pre-1967 borders. Apparently the treatment of Israeli-Palestinian relations in the novel is much more sophisticated and complex than the pure propaganda work made by the film. At any rate, the writer of the novel himself, Max Brooks, stated that the movie shares with his novel nothing but the title. So we can now safely blame it all on Brad Pitt, who is also a producer of the movie, and other members of the production staff! A clip by United Civilians for Peace about the Israeli separation wall, which was used in a Roger Waters concert. This entry was posted in Film and Literature, Politics and tagged Brad Pitt, IDF, Israel, Jerusalem, occupation, Palestine, racism, separation wall, West Bank, World War Z, Zionism, zombies. Hi there! Thanks for your comment over at http://andrewpegoda.com/2013/06/23/brad-pitt-not-so-hidden-racism-and-sexism-and-world-war-z-2013/. Sorry for the delay in my reply. Nice article here! I had NO IDEA about the actual wall around Israel. (I need to brush up on my world history!). Wow! That adds an entirely additional layer to the film, problematic points, and political implications. Another thought I had while reading your work is that “Brad Pitt” is cast as something of a religious figure in this film both by his actions and by the geographic and geopolitical setting of the film. Thank you very much Andrew for visiting my blog and for your comment, and I’m also sorry for the delayed reply! Yeah, one person alone cannot unravel all the problematic aspects of something like a film with lots of images, meanings, and symbols. You need different perspectives to see what is there. I personally didn’t think in particular about the white male savior issue, until I read your post about the film. Regarding Brad Pitt as a religious figure, I didn’t think about that. But it is worth considering, given the setting of the film. Legality is ONLY decided by courts at trial, not by opinions of foreign nations with self-serving political agendas. In 1920 the League of Nations created three ethnic homelands in the Middle East in the form of Class A Mandates. Arabs were to have Mesopotamia and Syria. The third, Palestine, was to go to the Jews. Jews in Mesopotamia and Syria would go to Palestine. Arabs in Palestine would go to Syria and, to a lesser degree, Mesopotamia. Syria was handed to the French, Palestine and Mesopotamia to the British. Britain and France were mamdated to serve only as custodial mentors, guiding each of the three Mandatory Homelands on the road to full sovereignity. Sadly, Britain violated the trust given to it almost immediately. Mesopotamia was handed to a son of the Shariff of al Hijaz, and renamed “Kingdom of Irak” [sic]. The Shariff fimself was made “King of Hijaz” so that together the Kingdoms of Hijaz and Irak formed a contigious territory stretching from the Persian Gulf to nearly today’s Jordan and north to today’s Southern Turkey. With Palestine, the British first severed 77% of the territory, everything east of the Jordan River, and handed it to a second son of the Shariff of Hijaz, calling this new territory, “Emirate of Jordan,” so that now, the Shariff of Hijaz controlled a contigious territory stretching to the Jordan River. When the British severed that 77%, both Britain and the League of Nations vowed that 100% of ALL land west of the Jordan River would remain Jewish- including of course, Jerusalem. From then on the British continued trying to break that vow. They consistently tried to get the Jews and the League of Nations to agree to sever the Negev Region, which constituted more than 40% of all land west of the Jordan River. This would then give the Shariff of Hijaz a contigious territory stretching from the Persian Gulf to the Mediterranean Sea! Luckily, they did not suceed. Part of this scheme was the idea of “Partition.” From 1929 to 1954 Britain continiously tried to sell the League of Nations on the idea of Partitioning all land west of the Jordan River , giving the Arab portion to Jordan. In 1936 the idea began gaining acceptance in the League of Nations as the violence in Palestine spun out of control. Because this was a General Assembly Resolution it was non-binding and was entirely contingent upon BOTH Jews AND Arabs fully accepting it. The fact that Arabs entirely rejected it made the plan null and void with no legal power. In 1948 Britain abandoned Palestine and Jordan was one of several Arab nations that imvaded Israel. When the shooting stopped Jordan controlled part of Judaea and Samaria and part of Jerusalem. In 1967 Israel liberated all held by Jordan. So, because of an illegal 19 year occupation by Jordan there are some, such as yourself, who imagine that it is illegal for Israel to declare Jerusalem its capital. Clearly that is ridiculous. To review: There has only ever been one single legal allocation of Jerusalem, by the League of Nations in 1920 (in effect 1922). No court has ever held a trial on the status of Jerusalem. Jordan gained it by force, only ever held it for 19 years. Saying that so called “East Jerusalem,” the area containing the Jewish Quarter, Temple Mount and Western Wall is occupied by Jews is ridiculously ignorant. Thanks Rachamim for dropping by and commenting on my article despite our obvious differences. Well, if you think that I have failed in my research, please provide references for your counter-claims. You mentioned that there are countries which recognize Jerusalem officially as part of Israel, could you please give specific examples and specific references? Regarding the League of Nations resolution you’re talking about, you didn’t provide any reference, but I presume you’re talking about the decision regarding British Mandate of Palestine. This decision didn’t say anywhere, as far as I know (please provide specific references, if it is otherwise), that “Jerusalem belongs to Jews.” It did acknowledge the Balfour declaration of granting Jews a homeland in Palestine, but it didn’t specifically say that Jerusalem should belong a future Jewish state. Of course, we are talking here about international legal formalities, not about the ethics of the policies of imperialist powers of dividing lands and promising them to whoever they wish for political agendas. This decision, moreover, is no longer in effect as you have indicated. The mandate was over in 1948 and I don’t think you can make any legal argument that Jerusalem belongs to Israel based on it, specially that there is a successor organization the League of Nations, the UN, and it doesn’t recognize Jerusalem as part of Israel. Finally, if you think I base my belief that Jerusalem belongs to Palestinians on the 19-year Jordanian rule, you’re absolutely mistaken. I believe so, because Jerusalem was for centuries part of greater Syria before Europeans arrived in the region in the late 19th early 20th century (and I mean by Europeans the British, the French, and European Zionist Jews). Jerusalem belongs to its native population: Muslim, Christian, and Jewish. Imperialist powers and their agents messing up with geography and demography doesn’t change the unalienable right for Palestinians in Jerusalem. So the disputed lands, who had it before Palestinians had it? Romans? Who kicked out the Jews? Who kicked out the Canaanites? or Phillistines or whatver? Irrelevant to this move. Anyway, racism in this movie. If you show a positive view of Israel are you automatically racist against Arabs? Palestinians? If you show a negative view of Israel are you automatically pro Arab? There is a defensive/expansionist wall in Israel yes, whether its right or wrong is not depicted in the movie. All that is said is that Israel, a very very defensive edgy, pre-pissed off state was more prepared to defend against the horde. And possibly used the pre-built defenses adapted against the zombie horde. Nowhere do they hint that zombies are arabs… though logistically most of those zombies would once have been arabs. This movie wasn’t racist, and any inference is by people who are hypersensitive to these things. It might be a little ignorant, but not intentionally Israel is the best, Arabs are all terrorists. If anything is promoting racism it is your ridiculous article.